(TibetanReview.net, Apr22, 2016) – A UK-based foundation has on Apr 14 presented to the Dalai Lama its 2016 award for advancing entrepreneurial approaches and solutions to the world’s most pressing problems. 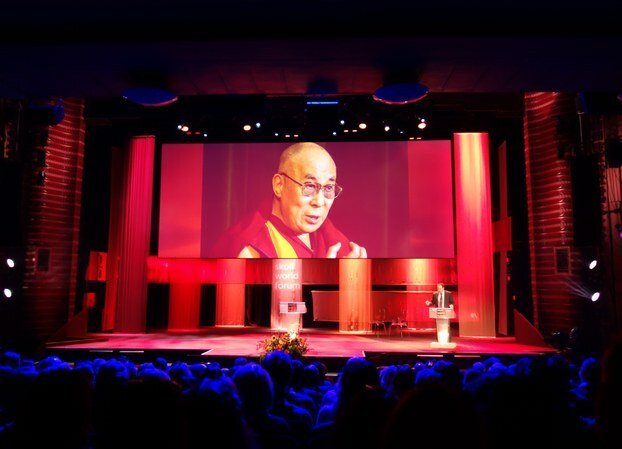 The Dalai Lama was presented the award for exemplifying “fierce compassion like no other”, which was this year’s focus of the Skoll World Forum, which sponsors the Skoll Global Treasure. The award was accepted by Mr Chonphel Tsering, London-based Representative of His Holiness the Dalai Lama to Northern Europe. He was joined in the award ceremony by Dr Barry Michael Kerzin, the Dalai Lama’s personal physician and a Buddhist monk. The ceremony was held at the Saïd Business School, University of Oxford. “This year the forum explores the notion of fierce compassion. We had hoped to bestow our Global Treasure Award on someone who exemplifies fierce compassion like no other,” Jeff Skoll, Founder and Chairman of the Skoll foundation, was quoted as saying. Calling him an inspiration to millions, the Skoll chairman applauded the Dalai Lama for his contribution to promoting warm-heartedness and embedding moral values in the economic system. In a personal letter to the forum, the Dalai Lama has expressed regret for being not able to participate in the award ceremony. Past recipients of the award have included Archbishop Tutu, Malala Yoousafzai and Graca Machal. The forum’s mission is to accelerate the impact of the world’s leading social entrepreneurs by uniting them with essential partners in a collaborative pursuit of learning, leverage and large-scale social change. Its delegates come from some 65 countries and participate in a range of interactive events in which delegates openly share, collaborate, innovate, and, ultimately, advance social entrepreneurship.